Home→Unique Claims to Fame→Canteen North Platte, Neb. 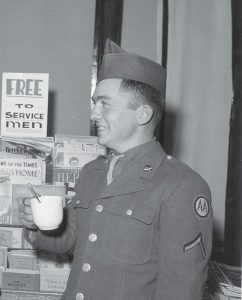 Two soldiers enjoy coffee and magazines available at the North Platte Canteen, which also gave candy, cigarettes and other gifts. Young women, 16 and older, served as “platform girls” who would greet the soldiers debarking from the troop trains during brief refueling stops. The most endearing American love story of World War II started out as a mistake. On a cold winter evening days after the attack on Pearl Harbor, a group of townsfolk laden with food, homebaked goodies and Christmas gifts gathered on the platform of the Union Pacific Depot in North Platte, Neb. They were eagerly awaiting the train transporting their hometown sons, brothers and beaus in National Guard Company D.
When the train arrived for its 10-minute refueling stop, the troops disembarked and encountered the anxious group. But the National Guard unit was Company D of Kansas, not Nebraska. Not a familiar face was found in the confused assemblage. After a brief awkward greeting of mutual befuddled stares, one local woman, Rae Wilson, stepped forward and handed out her treasures to the young soldiers. The others followed her lead. On Dec. 25, 1941, the North Platte Canteen opened, providing a few scant minutes of heaven to the young men and women en route to the hell of war. The canteen turned on the lights at 5 a.m. every day, seven days a week, for 54 months, and stayed open until the last train passed through, often after midnight. By the time it closed April 1, 1946, the canteen’s 55,000 volunteers had served up to 24 trains a day, blessing more than 6 million American native sons and daughters going to or returning from combat. The volunteers came from 125 towns, some 200 miles away, and included all ages and occupations. Young women, 16 and older, served as “platform girls,” standing outside to greet their guests with smiles and gifts. They gave popcorn balls containing their home addresses and became pen pals for many of the soldiers. At least one marriage resulted from the romance germinated during a brief stop at the canteen. Rationing and price controls only served to heighten the volunteers’ sacrificial spirit. They donated their sugar, our and coffee ration stamps to the canteen. Farmers gave eggs, milk, crops and other foodstuffs from their land. Local boy Gene Slattery, then 9 years old, literally gave the shirt off his back—hundreds of times—to help with the costs of running the canteen. He sold goats at a weekly livestock auction and a family friend jested he should sell his shirt, too. He promptly took off his shirt, sold it and gave the money to the North Platte Canteen. Word of his selfless efforts spread, and for the next four years, he traveled around central Nebraska, auctioning off shirts donated by North Platte clothing store owners, yielding many thousands of dollars. At one war bond drive, he received $1,700 for his shirt. 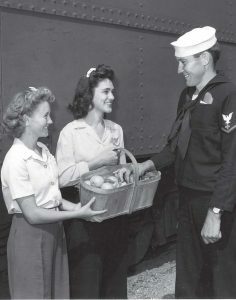 Wilson and her administrative successors scarcely thought to count the material blessings the canteen dispensed, but an effort was made in 1945 to count the food items distributed to the troops. After the war ended, rail traffic dwindled and the decision was made to close the canteen. The day after it closed, several volunteers arrived to clean up for the last time and share one final pot of coffee. One last troop train arrived. Not surprisingly, the angels of mercy gave the soldiers their coffee. In his 2002 book, “Once Upon a Town: The Miracle of the North Platte Canteen,” noted journalist and author Bob Greene lauds the spirit of the canteen, which he hopes can somehow be retrieved by a troubled nation. “What happened in that town speaks of an America we once truly had — or at least our parents did, and their parents before them. “We’re always talking about what it is we want the country to become, about how we can save ourselves as a people. We speak as if the elusive answer is out there in the mists, off in the indeterminate future, waiting to be magically discovered, like a new constellation, and plucked from the surrounding stars. The depot is gone, but the canteen is commemorated with an exhibit at the Lincoln County Historical Museum, 2403 N. Buffalo Bill Ave., North Platte. For more information, call (308) 534-5640 or visit www.lincolncountymuseum.org.